Welcome to the new look Tiare Black Pearl. After ten years of operating our Olinda and Mornington shops Tiare Black Pearl retail stores have now closed and we have adopted a new approach offering our customers the opportunity to purchase online, or by appointment at our new 'pearl studio' in Mornington, Victoria or in your own home (Melbourne and suburbs). We are progressively loading new product on our website so not all our jewellery is shown at present. 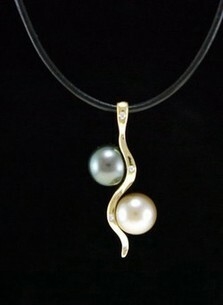 However our full product range can be viewed by appointment in our pearl studio. You can find our phone and email details under 'Contact Us'. Since our new approach to selling our products does not involve us in paying expensive overheads we are pleased to announce that all our pearls and jewellery have been discounted by 50% off our normal retail prices. Tiare Black Pearl is an initiative of Alan and Winnie Maguire, who after having lived in Tahiti for several years and visited pearl producers in Western Australia, Indonesia, the Philippines, China and Myanmar, are well-known for their pearl knowledge and expertise. Browse the website and the online shop to discover elegant pearl pendants, earrings, rings, bracelets, necklaces and strands combined with natural colour pearls in black, silver, pistachio, peacock green, aubergine, pink, white, apricot, cream and even blue! At Tiare Black Pearl you can buy all our pearls and settings loose or already combined for you, all at much less than our usual retail prices. We offer genuine discounts which reflect the savings we have made from not having the usual overheads (staff, rent, lighting etc.) involved in running retail shops. We realise that buying jewellery is a very personal thing, however, and that it can be hard to decide just from looking at photos. 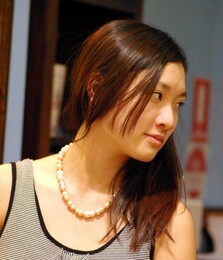 Therefore we invite you to make an appointment to view the pearl jewellery at our private 'Pearl Studio' in Mornington. Here you will be able to take your time uninterrupted by other buyers before making a considered decision. Alan or Winnie are also available to visit you (and deliver the jewellery) at your home for no extra charge if you live in the Melbourne metropolitan area. 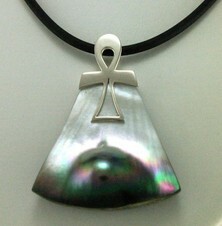 It is natural to assume all black pearls to be black. In fact the colours can include black, champagne grey, peacock green, eggplant, bronze, cream, pink and gold. Value is determined by size, shape, lustre and surface quality rather than colour, though the colours peacock green and eggplant are much appreciated by pearl connoisseurs. 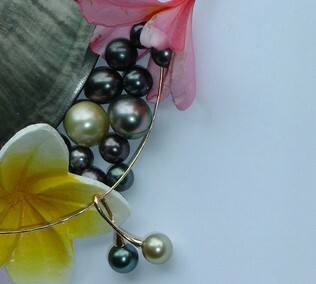 At Tiare Black Pearl, as well as black pearls, you can purchase pearls from all around the world. Silver and gold South Seas pearls from Australia, Indonesia, the Philippines and Myanmar (Burma), natural colour pink, white and apricot freshwater pearls from China and blue pearls from New Zealand. "Tiare" is the Tahitian word for the frangipani flower, the national flower of the Tahitian people, a symbol of the purity and beauty of the Tahitian landscape and way of life. Tiare Black Pearl allows you to choose from over 2000 pearls and select from a wide range of 9, 14 and 18 carat white, rose and yellow gold and sterling silver settings to construct a unique piece of jewellery. Make an appointment to see us in our Pearl Studio in Mornington to select from a wider range of pearls and settings and we will make the jewellery while you relax with a drink on our private seaside patio. 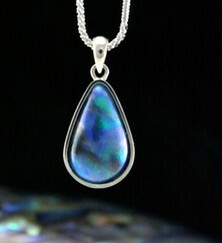 At Tiare Black Pearl look out for specials featured from time to time on unique jewellery such as Australian opal, and black jade, Burmese green jade, Siberian green quartz, mother of pearl and mabe pearl jewellery. Purchasers of our pearls receive an invoice and statement guaranteeing the authenticity of the pearl, its origin, natural colour and quality. Click on the tab for our online store to purchase securely using encrypted credit card facilties or ring us on (03) 5975 1128 or 0418 376 866 to arrange an appointment at home or in Mornington. Appointments are available in the evening or on weekends. 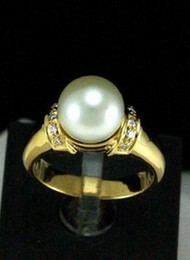 Retailers are welcome to contact us if you are are buying in large quantities or need to match a particular pearl.